So Caroline is now in glasses. I’ve had a few friends ask how we knew she needed them so I thought I might share here, in case anyone else is wondering. Caroline attends the public pre-K program in town. It’s really nice that they offer an early learning program but I suspect the purpose of the school has just as much to do with catching kids who need services as it does with giving kids a head start with their letters and numbers. The school is a great way to reach families who might otherwise get lost or not know they’re eligible for assistance. One of the things the school did this year was a vision screening for Caroline. In the fall she tested at 20/40 and then last month she tested at 20/50, so the nurse sent home a note suggesting we have her checked her checked by a real doctor. I called our insurance to ask if they had suggestions and they gave me a short list of local offices. None of the options specialized in pediatrics so I just crossed my fingers and hoped we got someone nice. The receptionist asked if Caroline knew her letters and I said “Yyyyyyy…….eeeeeessssssss?? Probably? Maybe?” because I realized I wasn’t as sure as I thought. 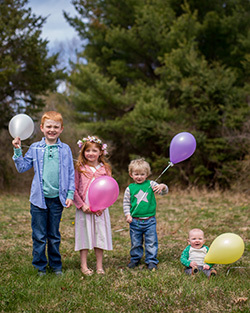 She suggested they use a tumbling E test instead of letters, in case she had failed based just on her knowledge of the alphabet instead of her sight. The tumbling E – just turning a big wooden capital E to match the one on the screen – worked pretty well. She seemed to understand how it worked and I felt like it was a much better option than asking her letters. The BAD parts of the test were that it was long. Way too long for a 4 year old. The way the chart was set up she was actually looking at it in a reflection, so the doctor could look at it on the wall behind her. But Caroline is a smart girl. She saw the chart was behind her and just kept turning around to read the E’s because THAT chart was way easier to read. The doctor was sometimes too busy looking at her notes to notice Caroline had turned so I was really doubtful of some of the answers. Then they did an up-close tiny-E reading chart but the way the doctor pointed at the lines was confusing. Caroline is 4. 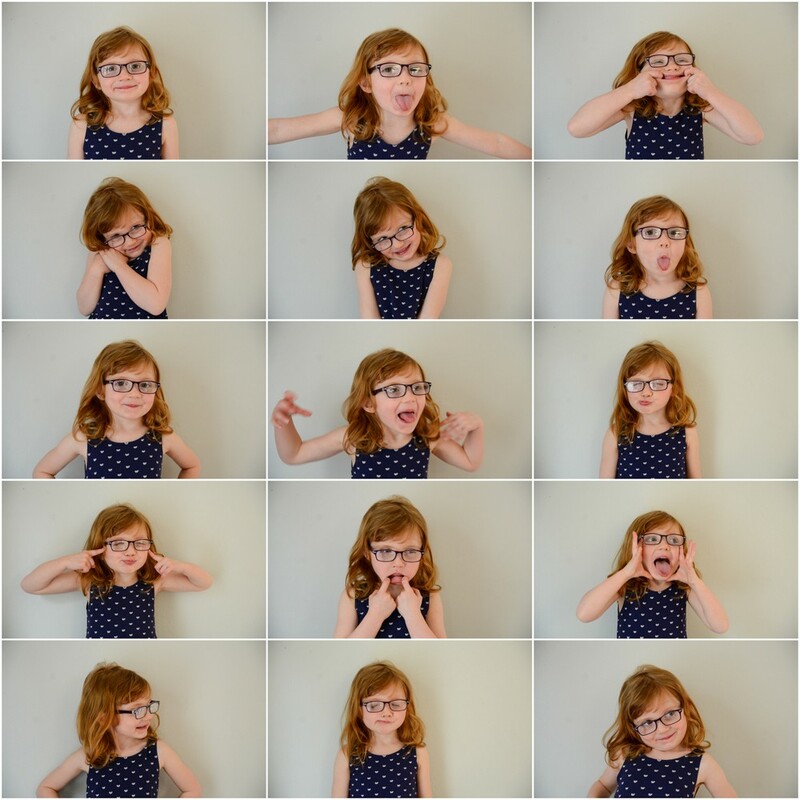 She’s a really vocal, smart, funny 4…but she’s still 4. If you’re pointing at a line with your nail but your fingertip is pointing at a different line maybe she isn’t sure which line to read and just says “No I can’t read it”. The exam did include the “look through these lenses and tell me which one is clearer” part that I HATE at eye exams. It really stresses me out, but it was one of the parts that I felt really helped Caroline understand why glasses were important. They also had her look into a machine that measured the shape of her eyes and dilated them to get some more tests. Overall it was an hour plus for the exam before we got the verdict. 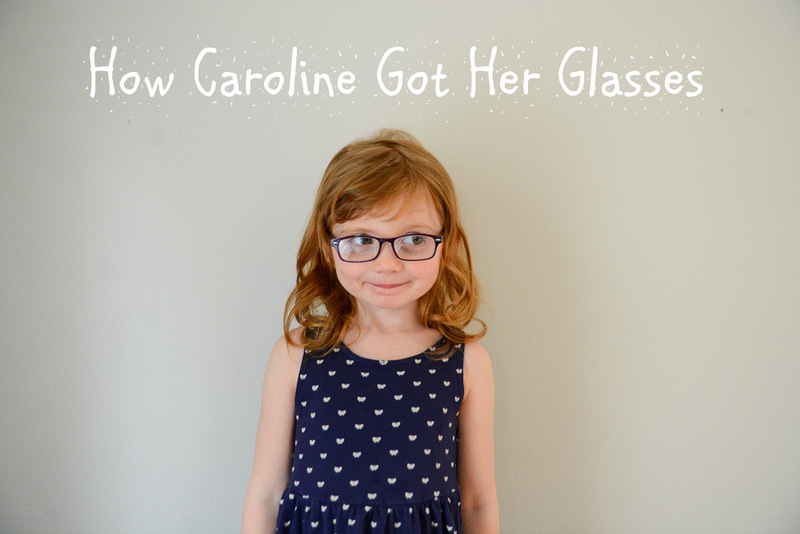 Caroline is both near-sighted and far-sighted, plus she has astigmatism in her left eye. Again, she’s ONLY 4 so there’s some doubt about her exact prescription right now and how it might change in the next few months and years. For now she’s in regular glasses, not bifocals. Even though I wasn’t 100% confident in her tests it was clear Caroline wasn’t seeing as well as an average person so I’m glad we’re addressing this now instead of waiting several years only to find out at 10 she’s never been able to read the board in class. We’re going back in 3 months for another evaluation, where she’ll know what to expect and won’t get so annoyed at the testing. I just really want her to be able to see. The optician in the office helped Caroline try on EVERY PAIR of kid-sized glasses they offer and she only managed to find one pair she liked. They cost $140, and that was after I asked them to put in the most basic lenses because a) she will probably break them and b) we’ll probably be getting different ones in 3 months. I’ve spent a lot of time over the last few days asking her where her glasses are, worrying about her glasses and freaking out that her glasses might be lost. Again, SHE’S ONLY FOUR. I need to just recognize that she will probably lose at least one pair of glasses before she learns to take care of them. After MUCH internet shopping while Caroline sat next to me saying “Those are NOT my style”, we ordered some cheap extra glasses from one of the internet retailers (I’m not linking/plugging anyone until they get here – the reviews online are either REALLY GOOD or REALLY BAD). As long as they show up I’ll be pretty happy since they cost $19 each and she is fighting me a little on wearing her current frames all the time. We’re starting with for school, for books and for TV and working up to all the time. Obviously they don’t help SO MUCH that she put them on and said “Mommy, I can see everything now! The sky is blue! There are words in these books!” Which is good! I am glad she wasn’t blind! But also maybe that would be easier than worrying the glasses are making it worse! I wish eye stuff was an easy diagnosis you can just do with a machine instead of still counting on self-reporting. Four year olds are unreliable. The good news is it’s 2015 and glasses are cool. She thinks they make her look smart and I totally agree. She looks so much older with her glasses and still absolutely adorable! We had similar problems with Alex’s hearing tests. They were about an hour long with a lot of my time spent trying to keep him focused on the test. Doctors should know that kids will not focus for that long until they get much older. Or they should at least give the parents wine during the testing. Just saying. She looks so stinking cute in her glasses! It’s a bummer that they didn’t have the picture eye charts. I took Rory for an exam when she was 3.5 because she seemed to be squinting a lot and ours had a chart for kids with pictures of stuff that could look like other stuff, I guess. It seemed a lot easier than the other charts they had. So cute. So sassy. My sister and I joke that we wish one of her kids had bad vision because kids in glasses are the CUTEST! Who knows – she’s got an 8 weaker at home right now so we might just be in luck? hehehe. I’ve seen the eye charts for kids at my optometrists – they have things like houses and dogs and trees and apples on them so definitely different from the tumbling E you speak of. I’m wondering if you like the $19 glasses and if so will you share the site you got them from. My 4 year old now needs them and like you don’t want to spend a ton for them to change and/or break! Thank you! We buy our cheap glasses from Zenni Optical. They’ve broken at about the same rate as our expensive glasses and when I had the doctor check the prescription was accurate.